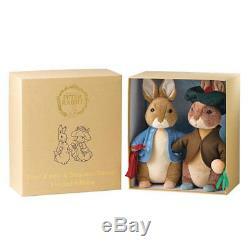 BEATRIX POTTER - PETER RABBIT & BENJAMIN BUNNY LIMITED EDITION SET - GUND. In 2016, Gund under license to Beatrix Potter released a boxed Peter Rabbit to commemorate the 150th birthday of Peter Rabbit. In 2017, A new very limited edition double boxed set is now released. Once again, only 500 are ever being made, and each one comes with a certificate of authenticity, marked with the number of each set. Both bunnies are made with the absolute highest attention to detail, and from the finest plush materials available. They come in a bespoke sturdy gift box, that is embossed with gold foil lettering, to really make the items even more exclusive. 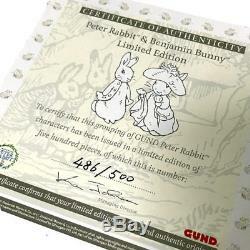 Contains both Peter Rabbit & Benjamin Bunnie plush toys & Certificate of Authenticity. All new materials, all brand new high quality materials. Suitable from ages 3+, but designed for a collector. Measures 14 inch / 36cm long (not inc ears). 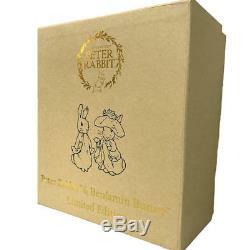 Peter Rabbit & Benjamin Bunny Limited Edition. Me To You Tatty Teddy. Payments to be made within 4 days please. We can also accept bank deposit to our NAB account (Australian buyers only). And choose Bank Deposit and our bank details will be there. These charges are the buyers responsibility. We do not mark merchandise values below value or mark items as gifts - AU and International government regulations prohibit such behavior. UK BUYERS IN PARTICULAR PLEASE CHECK. If you believe your product is faulty we require you take clear and focused pictures to show the fault before we can offer assistance. In some situations we may require you to return an item that you believe is faulty as part of the resolution process so please do not dispose of the item (possibly voiding your rights under Australian Consumer Guarantee law). Buyers - Please use the number on the NZ post website. CANADIAN Buyers - Please use the number on the Canada Post website. It will save you a lot of time waiting for us to reply. The item "Peter Rabbit & Benjamin Bunny Limited Edition Boxed Set Plush Toys GUND" is in sale since Wednesday, March 1, 2017. This item is in the category "Toys, Hobbies\Stuffed Animals". The seller is "stuffedwithplush" and is located in Adelaide. This item can be shipped worldwide.